The New Media Consortium and the EDUCAUSE Learning Initiative have released the latest NMC Horizon Report for Higher Education. This year, the Horizon Report’s Higher Education Edition does include graphics with some historical data, demonstrating how some technologies and topics appear and reappear and how some simply disappear altogether from the horizon. The topic names have been modified “for consistency,” the report’s authors say (although I’m a little unclear about some of these choices – how are “mobile learning,” “tablet computing,” and “bring your own device” separate technological developments? Why are “virtual assistants,” “learning analytics,” “adaptive learning technologies,” and “robotics” distinct from the overarching category of “artificial intelligence”?). Of course, the Horizon Report dates back to 2004, so this is only a partial look back at its own history. But the graphic still underscores (probably unintentionally) how haphazard the predictions about coming technological developments just might be. Perhaps part of the problem is a compulsion to always pick something new simply for the sake of newness (for the newness of tech and for the continued relevance and circulation of the Horizon Report itself). I can’t help but notice that mobile technologies have been one to three years out from widespread adoption since 2006. “Smart objects” (a.k.a. “the Internet of Things”) have been on the horizon since 2009. The LMS is now on the horizon for the very first time, despite being one of the oldest education technology systems out there, with origins in the 1970s and the development of PLATO. 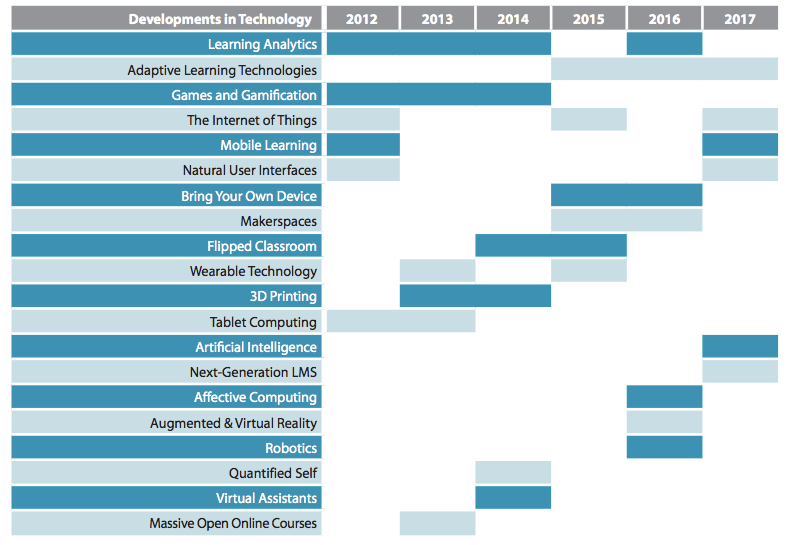 And gone from the horizon, these technologies from last year’s report: learning analytics, augmented reality and VR, makerspaces, affective computing, and robotics. Were they adopted? Were they rejected? The report does little to help us understand this. The report also identifies certain challenges to ed-tech adoption – solvable, difficult, and wicked challenges – but these too seem to reflect a rather odd set of tests that higher education might face. There’s no mention of Trump and little discussion of state and federal education policies (accreditation, financial aid, for-profit higher education, DACA, Title IX, campus carry, for example). No mention of academic freedom (although, to be fair, there is a brief discussion of adjunctification). There’s very limited discussion of funding (that is, limited to discussion of “funding innovation” and not to funding higher education more broadly or to how students themselves will pay for post-secondary education or personal computing devices and broadband). Education technology in the Horizon Report is almost entirely stripped of politics, a political move in and of itself. No doubt, I am asking the Horizon Report to do something and to be something that it hasn’t done, that it hasn’t been. But at some point (I hope), instead of a fixation on new technologies purportedly “on the horizon,” ed-tech will need to turn to the political reality here and now.